Manchester City recovered from their shock defeat at Sunderland and opened up a three-point gap at the top of the Premier League table with a comfortable victory over Liverpool. Roberto Mancini's side faced a test of character and resilience with a swift turnaround to play again only 48 hours after the loss at the Stadium of Light - and they passed the examination impressively. Liverpool were denied striker Luis Suarez's potency as they decided not to appeal against the eight-game ban handed down after the Football Association found the Uruguayan guilty of racially abusing Manchester United's Patrice Evra. And they sorely missed Suarez's menace as they enjoyed plenty of possession but never threatened to turn it into tangible reward. Liverpool goalkeeper Pepe Reina's error gifted Sergio Aguero an early goal and Yaya Toure rose to head home David Silva's corner for a second before the break. The only blot on City's night came when Gareth Barry was sent off for a second yellow card, which means he misses Sunday's FA Cup third round tie against Manchester United, but they sealed the win when James Milner scored from the spot after Martin Skrtel fouled Yaya Toure. It gave City the advantage over closest rivals United before their visit to Newcastle on Wednesday and enabled them to regain momentum after a goalless draw at West Bromwich Albion and the 1-0 reverse at Sunderland. Liverpool's efforts lacked punch despite the vast expense lavished on their forward line by manager Kenny Dalglish and they ended well beaten. Stewart Downing was thwarted by Joe Hart's crucial early block from Jordan Henderson's fine pass before Reina gifted City their opening goal. Aguero's shot was testing in the stormy conditions but the Spaniard made the basic error of failing to get his body behind the ball and the 20-yard shot dipped underneath him to relieve City's early nerves. The Argentine then lifted a shot just over before Edin Dzeko's effort took a heavy deflection off Glen Johnson and flew inches wide with the anxious Reina totally wrong-footed. As Liverpool appeared to be getting a foothold in proceedings, the hosts struck again 12 minutes before the interval. Reina made amends for his earlier error by turning Vincent Kompany's header over the top, but when Silva returned the resulting corner Yaya Toure got ahead of Johnson to head high past the the visiting keeper. 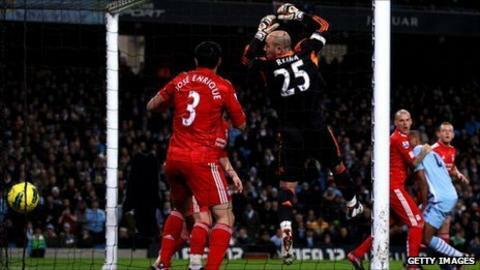 Kompany made a vital intervention at the other end to ensure City protected their two-goal lead until half-time, throwing himself bravely in front of Dirk Kuyt's shot as the Dutchman moved to turn in Andy Carroll's header. Once more the Reds saw plenty of the ball after the restart, but their lack of threat prompted Dalglish to make a double change just before the hour mark, sending on Steven Gerrard and former Manchester City striker Craig Bellamy for the disappointing Charlie Adam and Kuyt. They failed to make any serious inroads into the home defence, although they were given brief hope when Barry was sent off for a second yellow card, an innocuous block on Daniel Agger, with 17 minutes left. If they did have any hopes of a revival, they were snuffed out two minutes later when referee Mike Jones - a late replacement for Andre Marriner, who refereed the match in which Suarez had his flashpoint with Evra in October - pointed to the spot after Skrtel tangled with Yaya Toure. After Mancini had failed in demands to have Skrtel sent off by waving an imaginary red card, Milner converted the penalty emphatically. Substitute Adam Johnson struck the post with a curling effort as City pressed again, but matters had already been settled well before. Liverpool kept going and tested City keeper Hart with some late efforts from Gerrard and Downing, but he was more than equal to the task on a bitterly disappointing night for Dalglish's side.